We will find the best large-cap mutual fund to invest in 2019 and review the performance of our choice of best large-cap fund of 2018. The year 2018 was a great learning year for an equity investor. Though the index hasn’t done much in the whole of 2018, stocks have shown great moves. Some good stocks that were moving higher pre-2018 went down significantly. Stocks like Page Industries or Either Motors are down 30%+ from its peak. Similarly, other stocks have gone on to make a new all-time new high in 2018 as well — stocks like Nestle, Divis Lab, Reliance Industries, TCS, Infosys, etc. So it was a remarkable year for the large-cap stocks in general for the investors who invested in the right stocks and not in the high beta stocks. Similarly, those who invested in the right funds saw less red in the portfolio. Those who didn’t manage risk well saw deep cuts in the mutual fund portfolio as well. So 2018, was the year where investors realized, it is not all about returns but also about managing the risk. Still, I believe the amount invested in 2018, SIP or otherwise, will reap the benefits for the long-term passive investors. But again we should be forward-looking, and I see 2019 first half will be a great year to continue investing. As we are getting into the results season and has seen the results of TCS and Infosys, I expect 2019 will have a sectoral change in the leadership. It doesn’t seem like IT as a sector will lead the next up move. The process we will use will similar to 2018 for a large-cap fund. From the 4 and 5-star rated large-cap fund by ValueResearchOnline, we compare the fund performance for the past year. I do agree one year is very less time for fund performance comparison. But the idea is if the fund can perform well in 2018 and beat the underlying benchmark – It has the right process to select better stocks in the fund. So the money will be managed by the fund manager who can continue doing it in the upcoming years to maintain the outperformance. We nail down to the funds that have sizeable asset under management and lower expense ratio. Axis Bluechip Fund has scored well on both the fronts – one-year performance and expense ratio. Without a doubt, it is the best large-cap fund to invest in 2019. 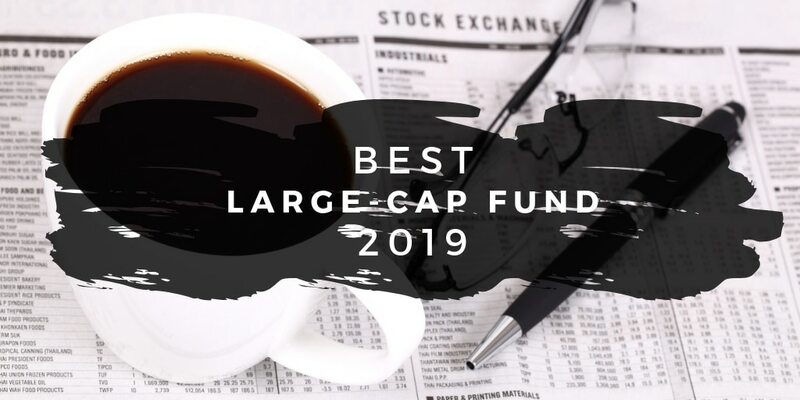 CRISIL also list it as the best large-cap fund of 2019. 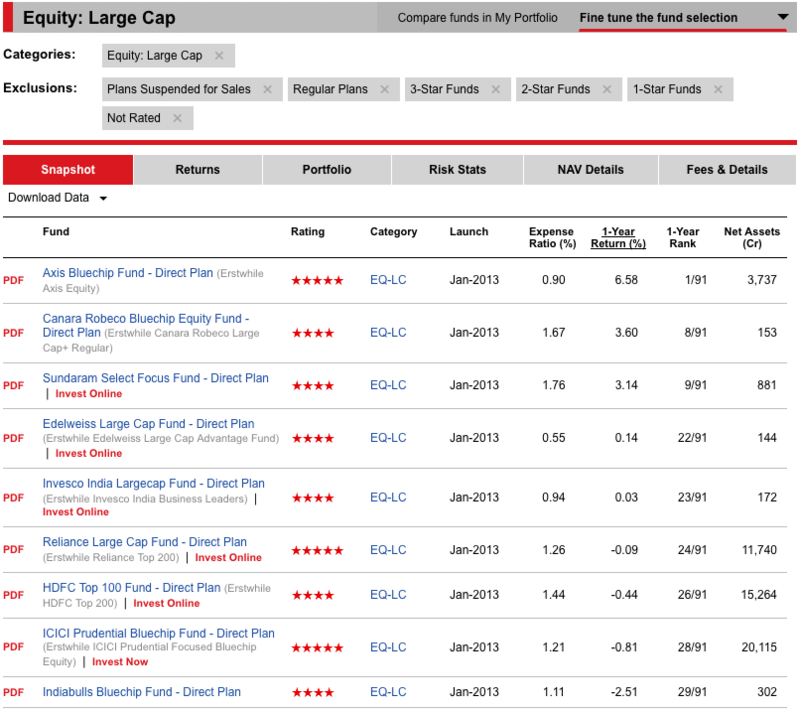 If we have to select more than one best large-cap fund, it has to be Reliance Large Cap Fund. A consistent performer in the past year with fairly large asset under management and is ok on the expense ratio as well. How The Best Large Cap Funds of 2018 Performed? Kotak Select Focus Fund – Is a Multi-Cap fund now. Mirae Asset India Opportunities Fund – Is a Multi-Cap fund now. So all the funds have moved away from being a large-cap fund. Still, each of the three funds has either beaten the new underlying benchmark index or is in line with its performance. Do not switch funds every year and pay the entry and exit load or long term capital gains tax. In case you have not selected a better performing fund earlier or want to move to a new fund for any other reason (move to regular to direct funds). Don’t exit the investment in the old fund. Just stop the SIP and let the invested amount remain and grow over time in the past funds. Create a new SIP in the new funds. As always this isn’t an endorsement of the above fund. The emphasis is on the process to select the best mutual funds using ValueResearchOnline and CRISIL data as and when you want to invest in 2019. And finally remember – It Makes Sense To Invest In An Index Fund in 2019.